Carmen Perez, a UC Santa Cruz alumna and co-chair of the Women’s March on Washington, is ranked no. 34 on Fortune Magazine’s “World’s Greatest Leaders” list. On April 28, she spoke as the keynote speaker for Alumni Weekend at UCSC. Her activism has stretched over a lifetime, beginning with playground bullies in elementary school and continuing in her years as a teenager when she began organizing protests. Now 40 years old, she holds global recognition for her efforts in activism. Born and raised in a neighborhood of low socioeconomic status and high gang activity in Oxnard, California, Perez thanks basketball — which she played from age five into college — for keeping her out of gang involvement. Every huddle before a game, the team would chant “Never give up. Dedication, determination, confidence, family” — values Perez still applies to her professional life. Despite having a strong tactic for motivation, she said she’s experienced times when she struggled to find the motivation and will to live. In her keynote speech, she described how she found herself standing in a church in front of an open casket. The church was decorated with streamers, balloons and a birthday cake reading “Happy Birthday Carmen and Patricia,” as her family found themselves burying her older sister on Perez’s 17th birthday. She and her siblings were enraged following the burial — angry at the driver who stole their sister’s life. It was in this time she felt driven to launch her involvement in criminal and restorative justice. 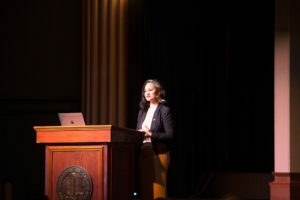 When Perez came to UCSC she studied psychology not with the intention of becoming a psychiatrist, she said, but in order to learn why she didn’t become another statistic given her upbringing in a gang-occupied neighborhood. In her time at UCSC, Perez also learned about injustices that frustrated her in her youth, things she couldn’t previously comprehend. Perez stayed in the Santa Cruz community for over a decade after college, putting her education in restorative justice to practice as a probation officer and later as the commissioner of Latino affairs for Santa Cruz County. She was also involved in the Santa Cruz chapter of Barrios Unidos, an organization dedicated to combating violence using both preventative tactics for youth and restorative tactics for convicts. “I was one of those students that ended up staying thirteen years after I finished. I stayed in this community because this community — even though I was born and raised in Oxnard — I did my growing up here,” Perez said. After organizing the Women’s March on Washington with fellow female national co-chairs Tamika Mallory, Linda Sarsour and Bob Bland, Perez found it important to introduce the idea of intersectionality to the international movement and stress how different communities need to support each other. Perez is outspoken about the importance of different communities to support each other in their effort to bring about change. Now a resident of New York City, Perez continues to advocate for change as the executive director of The Gathering for Justice, an organization that works to end child incarceration and racially biased mass incarceration. The organization just finalized the opening of a new California chapter called Justice League California.